It is my pleasure introduce to you Eileen Hinkle Rife and her newest book, a novel, Second Chance. As fellow members of American Christian Fiction Writers, we share the love of writing and Christian values. I hope you’ll pick up a copy of her book! An alumna of Christian Writers Guild and member of American Christian Fiction Writers, Eileen has published several non-fiction books, written newsletters, a marriage column, and over ten church dramas. Her byline has appeared in magazines, such as Discipleship Journal, Marriage Partnership, Mature Living, Christian Home & School, Drama Ministry, and ParentLife, as well as other print and online publications. Her fiction works include Journey to Judah, Restored Hearts, and Chosen Ones in the Born for India trilogy, and a stand-alone novel, Second Chance. She and husband, Chuck, conduct marriage seminars in the States and overseas. Her favorite pastime in this season of life is dancing with hubby, spending time with her daughters and sons-in-law, and playing with her six grandchildren. 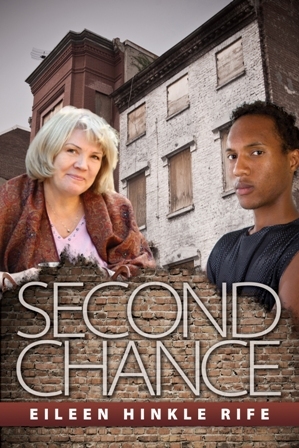 Second Chance: A poignant story of middle age, surprising friendships, and unexpected places. Inspired by Eileen’s own journey through the empty nest and her daughter’s and son-in-law’s work with inner city teens. Mave Robertson, a recent empty nester, wants the fire back in her marriage, but her husband, Jerry, remains aloof. Is he having an affair? A midlife crisis? When a neighbor suggests she “get a life,” Mave accepts the challenge and volunteers at an inner city teen ministry where she is thrown into a culture of drugs, gangs, and unwed teen moms. She soon discovers someone she can help, but might he also be the cure for both her stale marriage and her crumbling relationship with her father? Dareece Jackson, a teen from the projects, wants something in Mave’s purse…and he’ll stop at nothing to get it. “Lovingly crafted imagery and dialog will carry you into the lives of two very different families and show you what forgiveness really looks like.” —Lisa Lickel, author of Meander Scar. You can purchase a copy of Eileen’s books in paperback or eBook at Amazon.com, Barnes & Noble, or wherever fine books are sold. This entry was posted on Thursday, March 8th, 2012 at 10:05 AM and is filed under MEET THE AUTHOR. You can follow any responses to this entry through the RSS 2.0 feed. You can leave a response, or trackback from your own site. Eileen, Thank you so much for visiting my blog today. Pat – thanks for the post! Eileen – it sounds like an awesome book…one I’d definitely be interested in. I’ll have to purchase this one soon. Thanks for hosting me, Pat! Enjoy the weekend! I'm a Christian, wife, mom, grandmother and great grandmother to a terrific family. I write and love to read good Christian fiction and help fellow authors get the word out about their books, so it follows that I post book reviews on my blog in hopes that you will also reap the benefits of great books.